Founded in France and came to the US in 1914 as the Pathe-Freres Phonograph Company. Pathe-US would introduce a short-lived budget brand called Sapphire in 1915. Another label called Actuelle would be created in Sept. 1920. The Actuelle label was at first red, black, and gold on a buff, white, or other color background. They were replaced by a similar label in 1922 of gold and black for popular music or gold and maroon for classical. In 1922 the Pathe-Freres Phonograph Company went bankrupt. 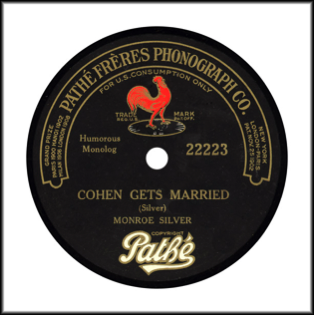 By Nov. 1922 Pathe-Freres was re-organized as the Pathe Phonograph and Radio Corporation. They would introduce two new labels: Perfect and Pathe-Actuelle. The Pathe-Actuelle (sometimes referred to as Pathe) label had a race record-series that was introduced in 1924. Pathe-Actuelle and Perfect were merged with the Cameo Record Corporation in Oct. 1927. Two years later, Cameo was bought by the American Record Corporation (ARC) in 1929. ARC dropped Pathe in March 1930 and Perfect in 1938. The Perfect record label can sometimes be seen in red shellac rather than black. Pathe Record Label would last from 1914-1922. In 1922, Pathe-Freres would reorganize as a different company and create a different label. The Sapphire Record Label, 1915. Actuelle Label, 1920. This would replace Sapphire as a budget brand label. Actuelle Label redesign in 1922. This redesign would not last for long as Pathe-Freres would reorganize as a different company the same year. Pathe-Actuelle Label, 1922. This was the new label of the former Pathe-Freres company, now reorganized as the Pathe Phonograph and Radio Corporation. After ARC buys the corporation in 1929, they would drop the label.